Veeam is organizing their annual data protection conference VeeamON 2019 this year in Miami. The event is held at Miami for 3 days, May 20-22, 2019. Veeam has launched a blogger contest where a blogger can win a free event pass, airfare up to $1500 and 3 nights hotel paid. The second price is Free event pass for the conference. Update: Unfortunately the Terms and conditions got updated with the fact that we cannot pass the price to anybody else. So we just encourage other bloggers to promote this Veeam raffle. I cannot attend due to my schedule, and as such, I will give an opportunity to other bloggers to promote and to win this price. The contest is open until April 15. Many blogs and bloggers will participate, I'm sure. (Make sure to read the Terms and Conditions VeeamON 2019 Contest for Bloggers in PDF, you'll find it Here , because if you try to participate with your blog and then you found out that your country cannot participate, you might be upset). 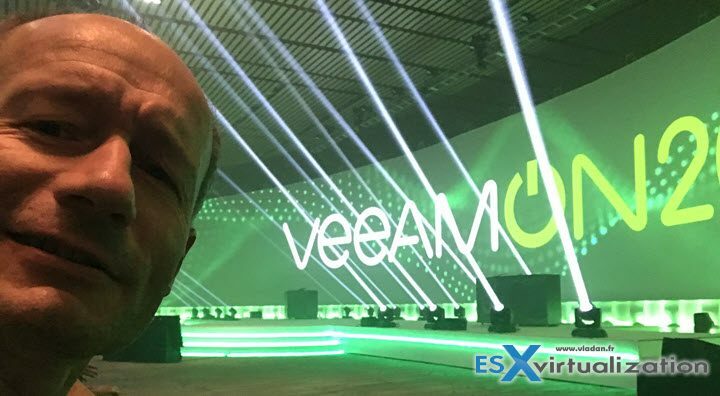 Me during VeeamON 2017 New Orleans..
To enter the contest, come up with the most engaging and meaningful content about VeeamON 2019 until April 15 and send the link to the blog post to [email protected]. The contest page is here. Well, here we go. As a Veeam Vanguard x5, I had an opportunity to attend VeeamOn in Las Vegas and in New Orleans. (I could have to go to Other VeamOn conferences, but my schedule did not allow me to do so). Learning and networking is the principal motivation to attend a conference like VeeamON. I always compare it with VMworld and I always say that VeeamON is like a VMworld, but a little bit smaller. What can you do at VeeamON? Outside the main program, there are over 50 breakout sessions, you can get over 50% discount on Veeam's training to become Veeam Certified Engineer (VMCE). Veeam Certified Engineer (VMCE) training are offered at a more than 50% discount only for VeeamON 2019 attendees. More information can be found here. Those are just a fraction of what will be presented there…. 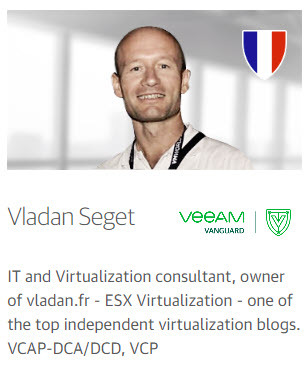 Again this year I've been rewarded Veeam Vanguard. It's my already 5th year as Vanguard. It's a great honor. Terms and Conditions VeeamON 2019 Contest for Bloggers in PDF is Here. Pay attention here, not all countries can participate. country with which the United States may prohibit export transactions. The Promotion is not open to employees or family members of employees of Veeam, its entities, or to anyone else associated directly or indirectly with the same and otherwise with administration of the Promotion. Strange not allow Italian people in, but …..
Once again, here is how you can participate. (until April 15 only). Create a blog post and send the link to the blog post to [email protected]. I think it will be again a great success for Veeam. Veeam has delivered long-awaited U4 which is packed with new features and innovations. Also, a completely free edition. Veeam continues to be N°1 in the data protection market. It’s the best and most reliable product whether you’re a very tiny shop or large enterprise corporation with many remote offices. Veeam's data protection conference VeeamON 2019 this year in Miami.